I loved making this personalised cake topper, it has lots of little details to make it personal to the bride and groom. The bride is wearing a short style wedding dress. I have only made a few shorter wedding dresses over the years, and this is a beautiful dress. The bride also is wearing brown boots, which look fantastic with the dress. The groom is wearing a black laced shirt, with a kilt and sporran. 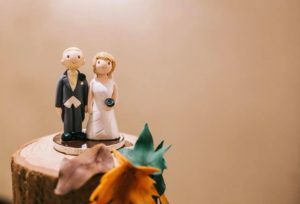 They have a great style for their wedding and this really shows in the cake topper. 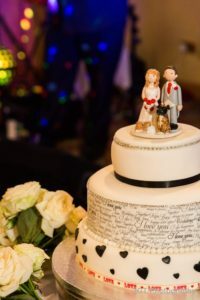 The bride and groom also wanted their cats included on the cake topper, and to add a wedding theme to the cats they are all wearing little bow ties! A lovely touch, very simple and effective. 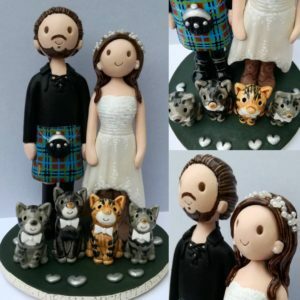 Pets are a popular addition to the toppers, and the colours and markings are all matched.